This groundbreaking book surveys the shifts in the aesthetic discourse and artistic practises that decisively influenced the shaping of the avant-garde during Franco’s dictatorship (1939-1975). On the basis of extensive, so far unpublished, archival material, it discusses the intellectual and cultural field as an important battlefield for fighting the regime from within. The study opens with a comprehensive historical overview on the cultural world from the end of the Spanish Civil War throughout Francoism and reveals for the first time the broader intellectual and cultural context of vanguard art considering the special relations and negotiation processes between artist, critics and institutions during a major gap in the historiography of post-war Spanish culture: the late Franco dictatorship (1959-1975). It then analyses in depth the important role that a group of art critics played as theoreticians and peers in key artistic movements from the 1950s onwards. Using their extensive international networks in the midst of the Cold War period, they decisively influenced the aesthetic and cultural debates of their time and very concretely helped shaping a completely new discourse for the avant-garde in Spain. 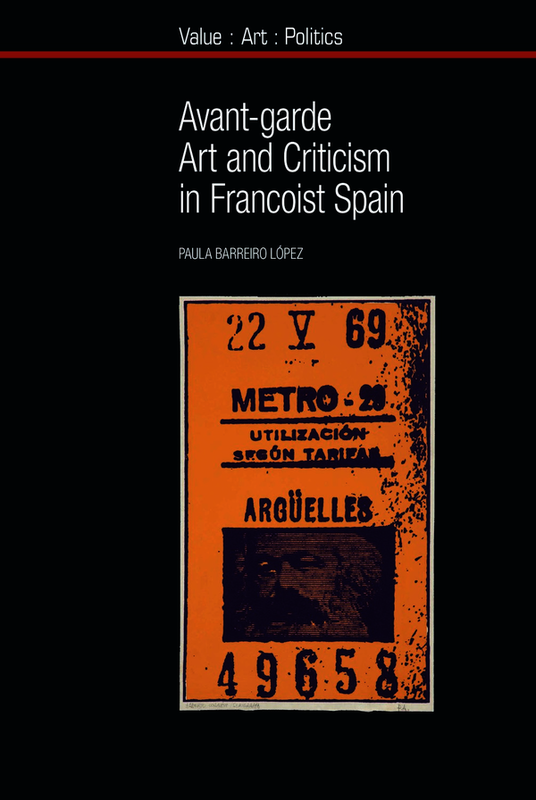 This book discusses the creation of this new discourse that linked culture and ethics/politics and analyses its impact on the intellectual and artistic landscape (visual, print and exhibition culture) during the last decades of Franco’s regime. It is indebted to a cultural historic approach that takes high culture, popular culture, politics as well as the history of ideas in account studying the reciprocal transfer processes within these fields and across European and American geographies. This study and its interdisciplinary approach will be of interest to scholars in art history, visual, cultural and museum studies of modern Spain in particular and Europe in general. Paula Barreiro López is lecturer at the Art History Department of the University of Barcelona (Ramón y Cajal programme) and head of research of Modernidades Descentralizadas. Since 2007 she has worked at several European research institutions and universities in France, the U.K., Switzerland and Spain. Her research focuses on art criticism, cultural networks and politics in Spain, Western Europe and Latin America during the Cold War as well as the diverse and divergent developments of modernity reflected in the art historic accounts within an increasingly globalised world. Her publications include the books Modernidad y vanguardia: rutas de intercambio entre España y Latinoamérica, 2015 (edited with Fabiola Martínez); Crítica(s) de arte: discrepancias e hibridaciones de la Guerra Fría a la globalización, 2014 (edited with Julián Díaz) and La abstracción geométrica en España, 2009.